Welcome to the Department of Computer Science at Queens College of The City University of New York. Computer Science is an exciting and rapidly changing discipline, and students at Queens College have the opportunity to study towards B.A., B.S., M.A., and Ph.D. degrees at the cutting edge of this expanding field. The CS Faculty at QC is composed of leading researchers in many areas of computer science, including: algorithms, analytics, artificial intelligence, complexity, computational geometry/topology, computer vision, database systems, datamining, game theory, machine learning, modeling, natural language processing, programming languages, quantum computing, networking, security, and visualization. 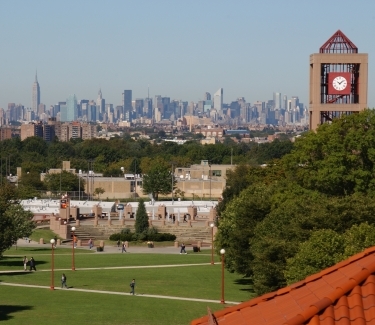 Queens College is situated on a beautiful 80-acre tree-lined campus in the Flushing neighborhood of the borough of Queens in New York City. The Manhattan skyline frames the campus to the west, and the Cooperman Plaza (outside the Computer Science department) is an excellent vantage point.